We sat down with Nedbank Private Wealth’s Grace Eames, Head of HR, and Lynn Kelly, HR Business Partner, to discuss their organisation’s involvement in the Government’s Apprenticeship Scheme and the value added to their company. How did Nedbank Private Wealth become involved in the Apprenticeship Scheme? Lynn: We were approached by the Department of Education, Sport & Culture and asked whether we would be interested in getting involved in a banking apprenticeship scheme because students were looking at options other than going to college, staying in school or going to university. We were keen to get involved, so we took on our first banking apprentice in 2017 and that young man has done phenomenally well; so much so that he is now a permanent member of staff. You don’t often hear about ‘banking apprentices’; is this unique to the Island? Lynn: Typically when you think of apprentices, you think of the building trades. This apprenticeship tries to get people into the financial world in a slightly different way. These employment opportunities really add local value and build the financial services industry. Have you taken on more apprentices? Lynn: Along with the banking apprentice in 2017, we said that we would be happy to take on two IT apprentices. 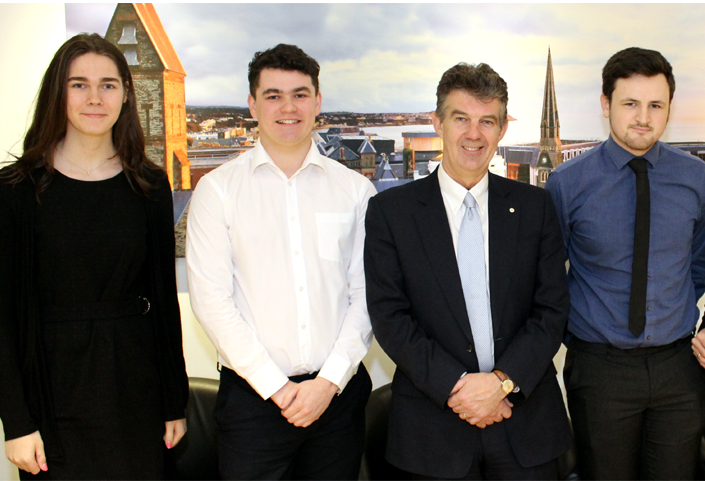 This year, the government asked if we’d like to stay involved and since then we have taken on a marketing apprentice and another banking apprentice in addition to our two existing IT apprentices, who are now in the second year of a two year course. Grace: They are great members of the team! All people need is an opportunity. If people get that opportunity, the possibilities are endless. Do you find that your permanent employees benefit from this scheme as well? Grace: I think it gives our staff the opportunity to train others and pass on knowledge which is a skill in itself. They get quite proud of their apprentices. They want to see them do well so it encourages them to share knowledge and be more collaborative. Have you had much government support with the program? Lynn: Yes, and they have been very flexible in terms of suiting the needs of our organisation and our apprentices. Grace: Our marketing apprentice is actually a university graduate. The government recognises that young people might change career direction after graduation. Our marketing apprentice has a degree in a different discipline, in humanities, but marketing really appealed to her and she wanted the opportunity. She applied for the apprenticeship and the government agreed, so that’s great. There are some really good quality candidates on the Island and the government is keen to support them to find employment locally. Lynn: Originally, the government was planning on having a banking course at the college to support our banking apprentice. However the logistics didn’t quite work out, and we felt there might be more value in learning within a real working environment, so we came up with a solution. Nedbank Private Wealth will support the individual, we’ll pick the qualification, we’ll coach them through what they need to do for distance learning, and we’ll make sure they get all the support that they need and deliver at the end of it. Government said go for it. So we did. The benefits of being in a small environment, like the Isle of Man, are that you’re not bound by so much bureaucracy. We’ve got a lot of flexibility and a more open and available government. You can speak to a real person, and things get done quicker on the Island. If an organisation gives back to the community it’s a circle. Everyone benefits - businesses do well, the economy does well, and ultimately the people do well. Do you offer any other training for young people? Lynn: We provide a lot of employment opportunities, during school holidays for A-level and university students, as well as term time work experience opportunities for younger local high school students. We train them up to undertake a proper role so they can come in and take over an employee’s role, freeing that employee up to take a holiday, undertake development opportunities - whatever is needed within the business. Grace: Especially in the summer. Lynn: Last summer we had five students working with us, gaining valuable work experience as well as earning money. There’s always something we can get them involved with. It’s part of the fabric of our company. We do what we can, where we can. It must take a lot of training to get these young people upskilled into those positions. Lynn: Work experience students come in as young as 15 years old, before they make their exam choices. We offer one of these positions per quarter. They come in for a week and that week is scheduled within an inch of its life! They work with different teams and because it’s just one student in at a time, he or she gets a lot of individualised guidance. They get to get involved in actually ‘doing things’. This experience gives them ideas as to what they might want to gear their careers towards. Some students come back at 18, during term breaks, and get some paid work experience in our operational services area. Grace: They bring in new skills each time they come in- fresh ideas, technical skills. We learn a lot from these students. Lynn: Because they ask ‘Why’. ‘Why are we doing this?’ ‘Why is that done that way?’ We love it. It helps us re-evaluate the way we do things. Nedbank Private Wealth has been a supporter of Junior Achievement for a while. What sorts of things to you do for them? We play a game that’s very much like monopoly and then do some ‘speed dating’ types of interviews. There are a variety of Junior Achievement programmes and students learn life skills and about the business world. They build confidence and business savviness. Grace: We try to give them the confidence to approach people. We teach them to write their introduction letter and tease out of them how to talk about themselves in an interview. Some of these students are superstars, but they aren’t necessarily confident in their skills yet, so we try to get them talking about themselves. It really sounds like Nedbank Private Wealth is truly and wholly invested in the Island’s future. Grace: You feel on the Island that you can actually make a difference in something. You can get support and encouragement from an open and engaged government. We want to keep our Island special and nice. We care. We are proud of our Island. Thank you very much to Grace and Lynn of Nedbank Private Wealth for sitting down with us and discussing the many opportunities available at Nedbank Private Wealth and in the Island’s financial sector. If you would like more information on opportunities available through the government’s apprenticeship program and other schemes, please visit https://www.iomdfenterprise.im/funding-and-support/.